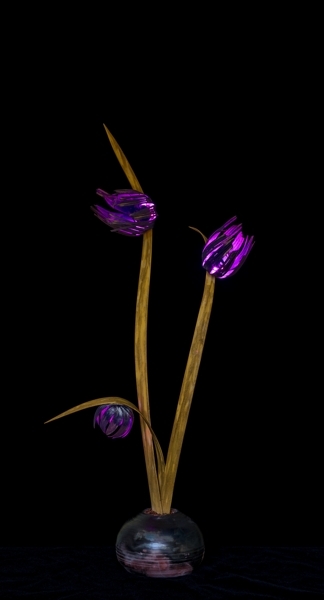 Fleur de bois artwork collection sculptural lighting. The blades and blooms on this lighted sculpture are made of maple that has been steamed into shape. 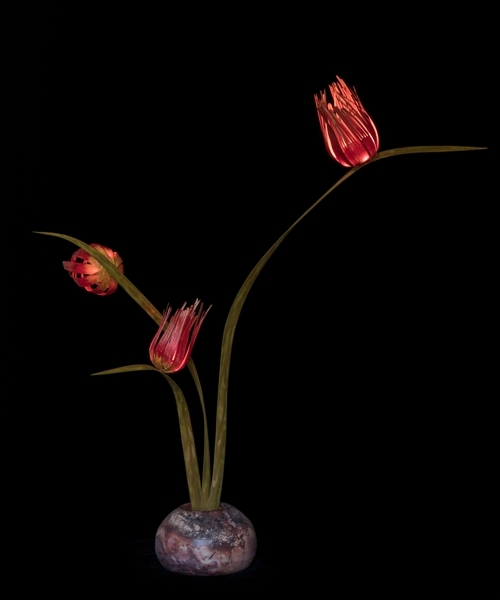 A vibrant red in the flowers provide a drastic contrast when the piece is turned on. The composition is very similar to a flower bouquet with a little touch of ikebana in its design. The flexible and elegant green blades would sway in a light breeze. The base is a small saggar pot with earthy coloring and texture. The light source in the blooms is from low power LEDs. Dimensions: 22" tall x 14" (at widest), the pot is 5" diameter.. 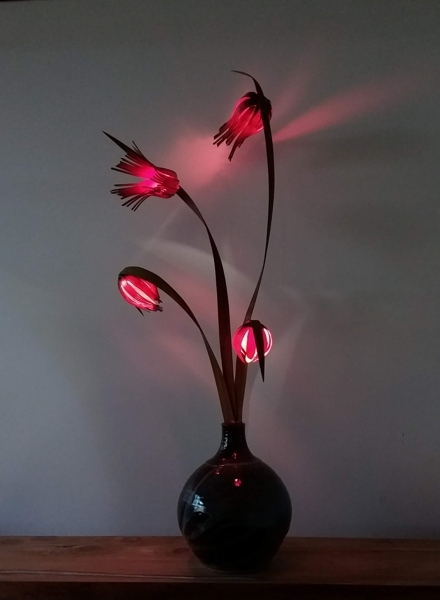 This daring piece feature a striking red lighting that creates some surreal glow in the dark. The blades and blooms on this sculpture are made of maple that has been steamed into shape. 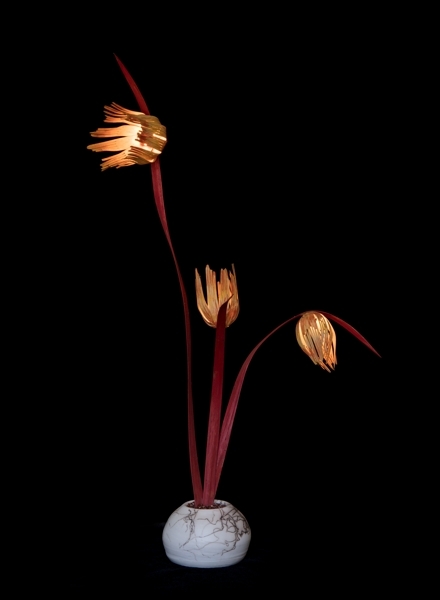 The composition is very similar to a flower bouquet with a little touch of ikebana in its design. The flexible and elegant green blades would sway in a light breeze. The base is a small saggar pot with earthy coloring and texture. The light source in the blooms is from low power LEDs. 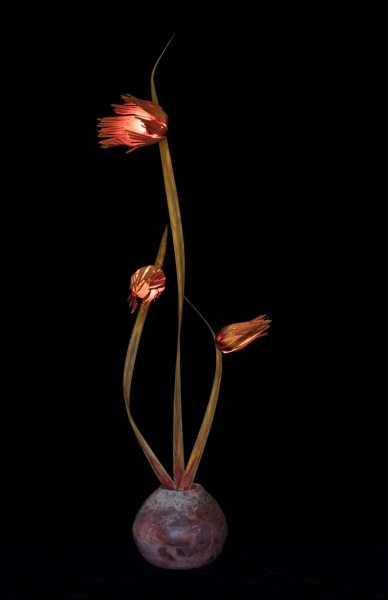 The blades and blooms on this lighted sculpture are made of maple that has been steamed into shape. The orange flowers provide a drastic contrast when the piece is turned on. The composition is very similar to a flower bouquet with a little touch of ikebana in its design. The flexible and elegant red blades would sway in a light breeze. The base is a small white pot with horse hair imprinted . The light source in the blooms is from low power LEDs. Daring green lighted sculpture with natural finish blades. The green flowers provide a drastic contrast when the piece is turned on. The composition is very similar to a flower bouquet with a little touch of ikebana in its design. The flexible and elegant maple blades would sway in a light breeze. The base is a small saggar pot with beautiful hearthy tones. The light source in the blooms is from low power LEDs. This daring piece feature an unusual purple lighting that creates some surreal glow in the dark. The blades and blooms on this sculpture are made of maple that has been steamed into shape. The composition is very similar to a flower bouquet with a little touch of ikebana in its design. The flexible and elegant green blades would sway in a light breeze. The base is a small saggar pot with earthy coloring and texture. The light source in the blooms is from low power LEDs. 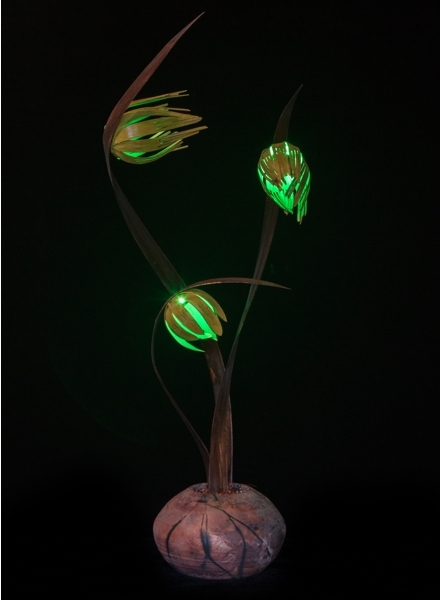 The blades and blooms on this lighted sculpture are made of maple that has been steamed into shape. A vibrant orange color in the flowers provide a drastic contrast when the piece is turned on. The composition is very similar to a flower bouquet with a little touch of ikebana in its design. The flexible and elegant green blades would sway in a light breeze. The base is a small saggar pot with earthy coloring and texture. The light source in the blooms is from low power LEDs.